Discover how to transform decision practices at your company. Benchmark your company against the best. Find and fix your biggest decision blind spots. Activate leaders and level-up your decision practices. 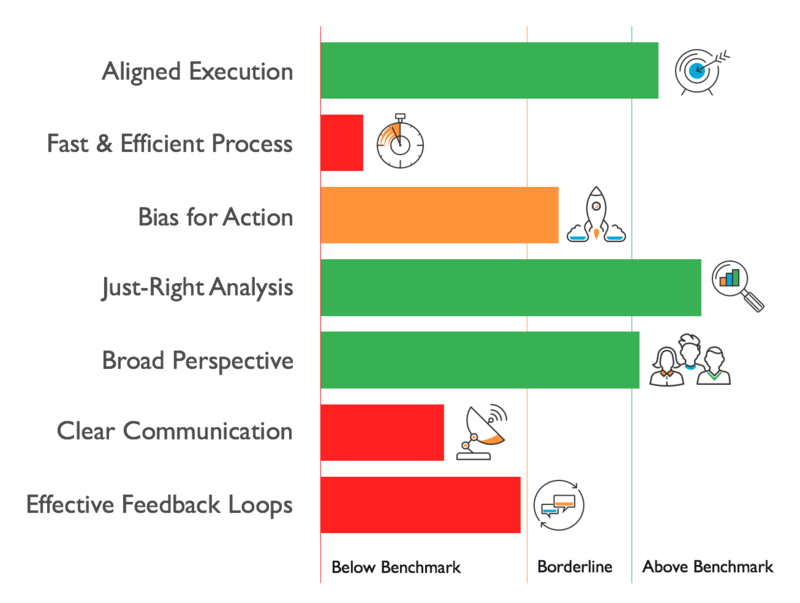 When you work with us to transform your decision practices, we start with a 5-minute survey of executives and managers that uses our extensive database to highlight where you excel and diagnose where you fall short. We present the results in an executive workshop to give you evidence-based advice and plans to address challenges. Then with a clear diagnosis in hand, we can work together to activate change, build skills and scale success across your organization. Let's transform how decisions work. Consistently communicate decisions to keep people in the loop while killing ineffective meetings and emails. Get broader input while driving faster, more efficient decisions that align people, projects and business goals. Increase bias for action by delegating decisions with transparency and accountability. Ready to start? Let's diagnose decision practices at your company.